We know how vital water and staying hydrated is to our quality of life, yet it is something we frequently underestimate. It seems as if drinking water is like a chore for us, and it definitely shouldn’t be! Our bodies are largely made up of water; it is what feeds our fundamental bodily functions and innate systems of immunity, digestion, and hormonal balance among many more. We depend on our caffeine or sugar fixes to get through the day but if we simply did a little more of one particular thing we would feel so much better for it- yes, drink water! 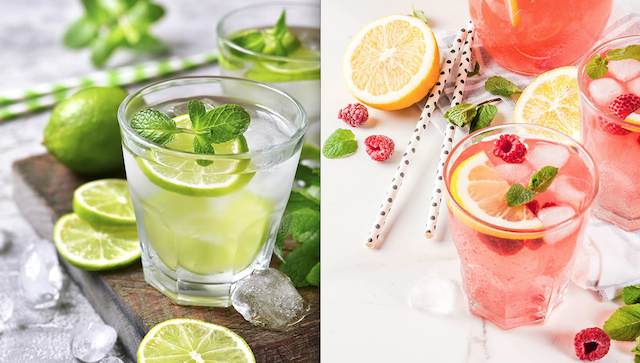 It doesn’t need to be boring… we can create our own healthy water by conjuring adventurous and tasteful infusions, such as cucumber, raspberries, lavender, citrus fruits, mint or coconut. All we need to do is make the decision to live with wellness at heart and as our principle. Here are some tips to help you stay hydrated! A great way to increase or add to your water intake is to simply eat more fruit and vegetables! Many of these are comprised of over 70% water and also contain the multitude of vitamins and minerals that we need for health and vitality. And as suggested above, infusing fruit and vegetables into your water not only adds taste but packs a mightier mineral punch also! 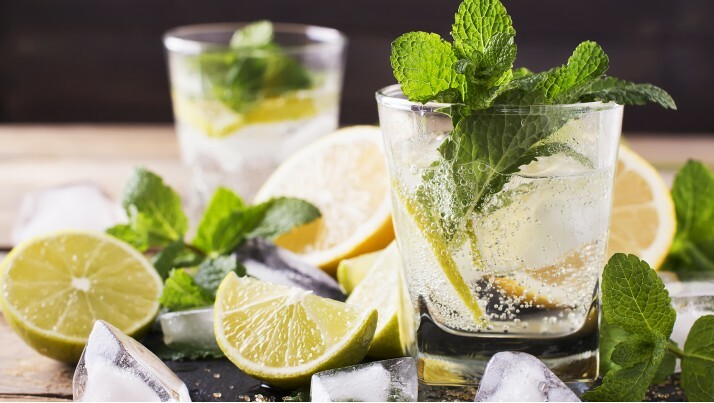 As we move into the warmer summer weather we can pre-prep some natural ices to keep us cool- water and fruit…frozen, keeps you chilled and hydrated too! 2. Keep your water visible! We often keep our bottle of water tucked away in our handbag or hold-all. If we can’t see the water in front of us then we forget that we actually have it! Keep your water where you can see it, perhaps on your desk when at work or on the treadmill bottle holder at the gym. Sip on water throughout the day and when you are out and about…make it a habit that you create, like your own ritual of drinking water. Sugar-laden and sweetened/unsweetened juices can actually just dehydrate us more; the same applies to caffeine and also alcohol that act as diuretics. When you are drinking fruit juices, try to incorporate 50/50 in your glass, half water, and half juice. On an evening out, aim to have a glass of water in between your alcohol based drinks. This will help to keep you hydrated and mentally sharper too! Living a quality life means to live, share, & experience life with the ones you care about and love. But if we don’t have good health how can that be accomplished? At Qlife, this has become a great focus for them. Founded in May 2017, Qlife realized that many people take their health for granted until it’s too late and many of us do not live as healthily as we should. This is the main reason which drives and motivates their company to develop products with a keen focus on better health. Improving health begins with strong foundations, and the first step is proper hydration. Statistics show that more than 75% of Americans are actually dehydrated and don’t even know it. Also all those sugary drinks & sodas on the market today do not help! So in 2017, Qlife launched their first product: the Q-Cup, a portable hydrogen-rich water generator. 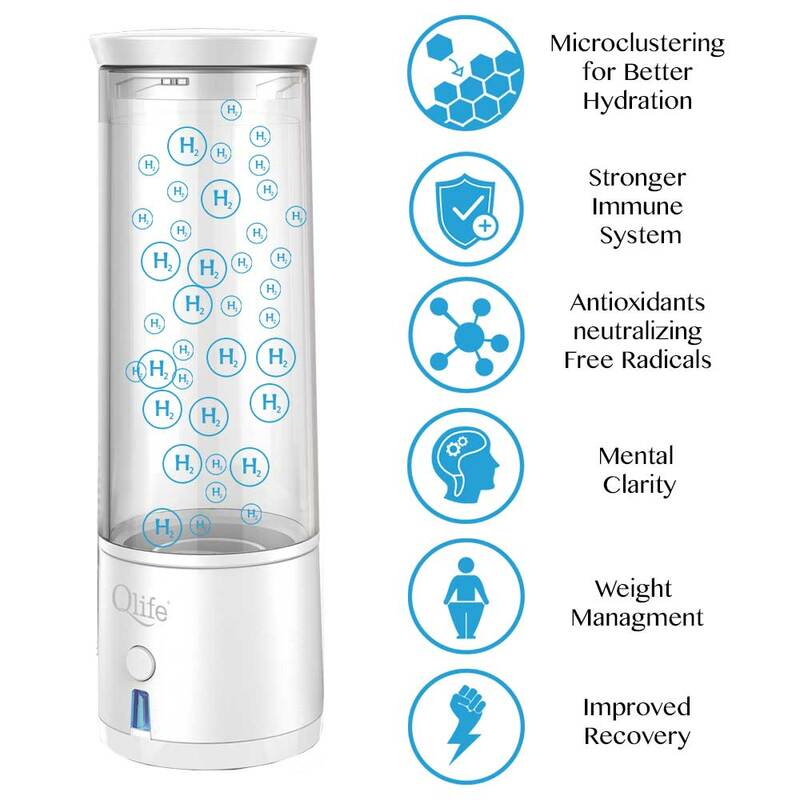 The Q-Cup is designed to help people optimize the benefits they can get from any drinking water by dissolving molecular hydrogen, a world-class antioxidant into the water. The Q-Cup uses a special electrolysis process to produce molecular dissolved hydrogen. Due to poor lifestyle choices, bad environmental factors and stress, our bodies actually create Free Radicals. Not all free radicals are bad, but the hydroxyl free radical does the most damage to our bodies. Studies have shown that the hydroxyl free radicals are what cause us to develop the disease, cancers, age, & where our bodies down. Infused molecular hydrogen acts as a selective antioxidant that will neutralize specific free radicals (hydroxyl being the worst) in our bodies. It does that by changing change their molecular structure into a substance our bodies actually need which is H2o, water. Medicals studies being released have shown how powerful H2 (hydrogen) is for significantly reducing free radicals, inflammation, neuroprotection, injuries, metabolic syndromes, aging, reduce lactic acid build-up, and more. With a simple press of the button, the Q-Cup will start a 5-minute generation process. The water will electrolyze through a high-grade titanium plate and due to the use of a special SPE/PEM membrane that will produce dissolved hydrogen water purer than older technology generators. As the water becomes infused with dissolved hydrogen you can see some of the hydrogen bubbles being formed. Since hydrogen is the lightest gas it escapes easily and it is important to always drink the water fresh. It recommends about 2-3 cups a day to keep your body well hydrated and protect yourself from harmful free radicals. Another great feature of the Q-Cup is the ability to create natural disinfectant water. By adding a pinch of salt and holding the button for 5 seconds you can activate the EDC or self-cleaning mode which can be used to disinfect the cup. In this mode the Q-Cup uses a reverse polarity, to start creating acidic sanitizing water with a pH of around 2.5. Eliminate the need for chemical cleaners too! Just get a simple spray bottle and put the cleaning water into it to start disinfecting bathrooms, kitchens, public places, and etc. Q-Cup is a must have the product to help your body maintain the proper hydration you need while also fighting off free radicals from the antioxidant hydrogen. The Q-Cup is super portable and can be connected with different water bottles that you buy at the store. Using 2 high-grade Polymer Lithium batteries allows you to use the generator up to 20 times per charge. Take it anywhere you go and enjoy hydrogen-rich water anywhere. Studies show links with UV ray exposure and skin cancer. These UV rays cause our skin to develop free radicals, age more quickly and can cause skin cancers. Hydrogen has a great preventive measure to protect the skin from UV damage and also fight free radicals. So, in January 2018, the Q-Mist was born! The Q-Mist is the only true dissolved hydrogen water nano diffuser in the market today. Combining hydrogen technology with nano diffusion technology Qlife developed a product that not only moisturizes the skin for better absorption but also protects the skin from free radical damage. The Q-Mist uses 2 titanium rods and through electrolysis creates dissolved hydrogen into the water. The lithium battery allows you to charge the Q-Mist and take it anywhere. Simply place mineral water into the Q-Mist and slide down the button to activate the hydrogen mister. You can spray the hydrogen mist when you’re in the car or outdoors. It provides the ultimate cooling hydration sensation while protecting your skin from free radical damage. Q-Mist will moisten your skin and help make you look healthier and vibrant each day. Qlife is here to help people enhance their quality life by providing great quality products that enhance a better lifestyle. So, it’s your lifestyle, your choice!